When it comes to the economy, the bold statistical strokes tell almost the opposite of some Wisconsinites' stories. A decade since the 2008 crash, a slow recovery has brought Wisconsin out of the economic depths of the Great Recession. The state has enjoyed a historically low unemployment rate just below 3 percent in 2018, according to the U.S. Bureau of Labor Statistics, and the overall state economy is more than twice as productive as it was at the end of World War II. At the same time, a few long-term trends are still keeping many Wisconsinites from fully enjoying the fruits of this expansion. The state and nation have yet to pull out of a decades-long trend of wage stagnation, and stark geographic and demographic disparities show that the boom isn't working for everybody. The Center on Wisconsin Strategy at the University of Wisconsin-Madison, an economics and policy think-tank that is non-partisan but "(seeks) a world of equal opportunity and security for all," explored these issues in the its State of Working Wisconsin 2018 report. Laura Dresser, the center’s associate director and a co-author of the report, discussed their findings in a Sept. 14, 2018 interview with Wisconsin Public Television's "Here & Now." In 1979, Dresser said, the median worker in Wisconsin earned $17.30 an hour, adjusted for inflation to 2017 dollars. As of 2017, the median worker in the state earned about $18.30 an hour. "We know that the productivity of the overall economy is substantially higher," Dresser said. "We've seen productivity and gross domestic product grow substantially over that period. 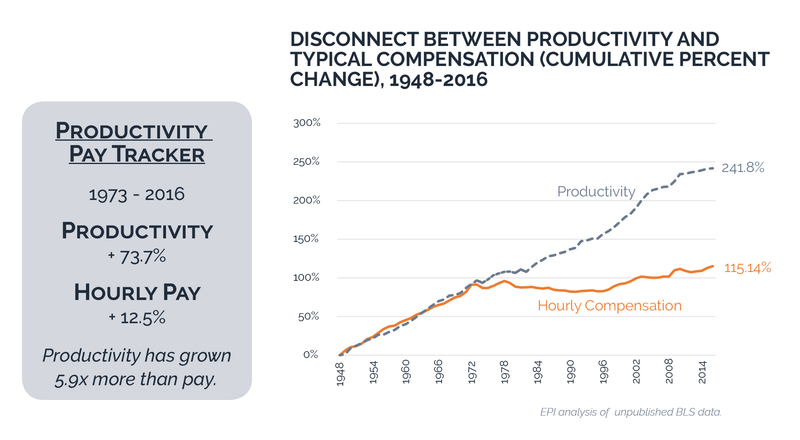 The average return to the worker is about 3 cents an hour per year over that period to get that dollar more now. That's long-term wage stagnation. We've been seeing it even in this low-unemployment time, and that's a really troubling sign." A booming economy doesn't translate to gains for all workers. The report doesn't gloss over the fact that the past decade's recovery has in fact brightened some economic measures — for instance, it notes that fewer Wisconsinites who want full-time work are having to settle for part-time work, and that Wisconsin's median household income ($63,4000) is slightly higher than the national figure ($61,400). Still, Dresser said, the state's economy as a whole is "treading water" over the long term, and 2018's measures represent a mere return to 2000 levels in terms of how ordinary workers benefit, rather than a new age of prosperity. In recent years, Dresser and other economic analysts have stressed that the state's economic gains are leaving behind people of color and rural residents, and that Wisconsinites are persistently stuck in low-wage jobs. The COWS 2018 report notes that all three factors continue to bedevil Wisconsinites. Among its findings are that Wisconsin's African-American unemployment rate is 9 percent — a disparity Dresser and colleagues say is the worst in the nation — and that rural counties are among those with the highest unemployment, as these areas continue to lose jobs and urban areas grow them. Previous State of Working Wisconsin reports from COWS have even found wages declining for some groups, including African-American men. Dresser also discussed how 675,000 Wisconsin workers are earning $12 or less per hour. "That's one in five workers," she said. "I think sometimes people feel like, 'I worked in a low-wage job once.' People work in those but they don't last forever. But when you see that one in five workers is in a job paying $12 an hour or less, you know that those workers have a fraction of the health-care benefits through their employment, and pension, and even sick leave is hard to get at below $12 an hour. It's just a different reality for many, many workers." 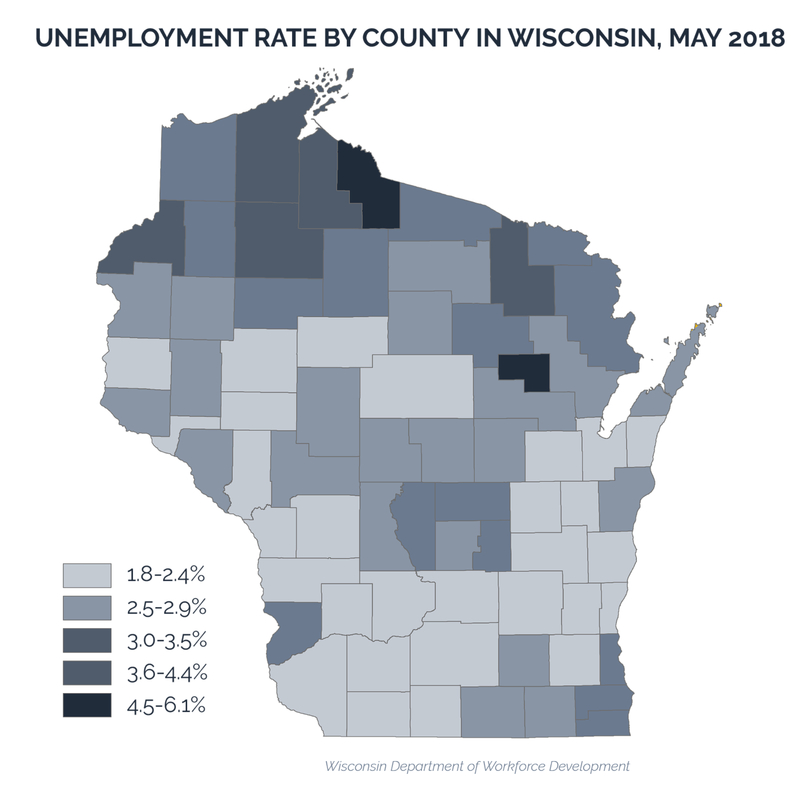 Why Economic Recovery Still Hasn't Come For Many Wisconsinites was originally published on WisContext which produced the article in a partnership between Wisconsin Public Radio, Wisconsin Public Television and Cooperative Extension.